Check out Discovery Walking Guides’ latest ENewsletter. It’s packed with plenty of ideas for escaping winter to wonderful warm walking destinations, plus features on the Isle of Wight and Fuerteventura. 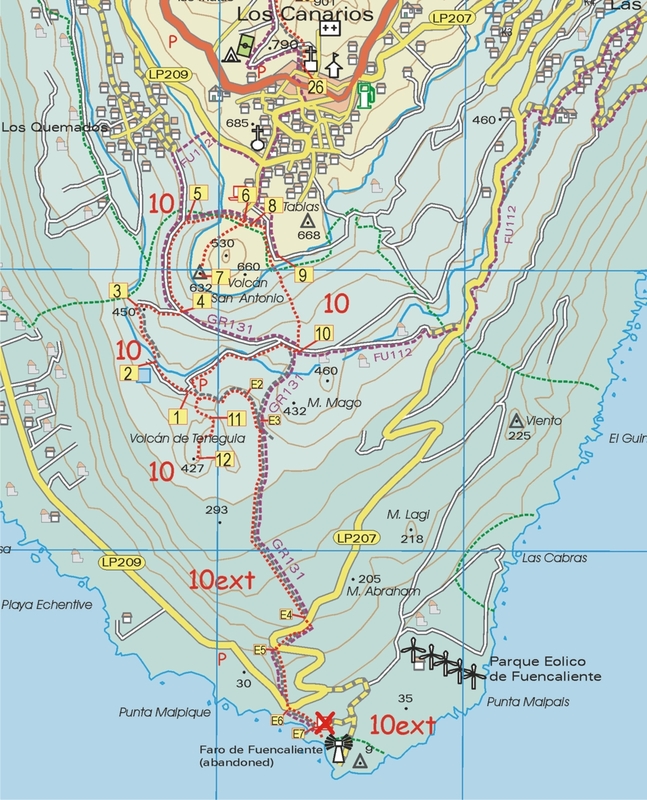 Walk 1 : Coming from the west, there is now a turn-off just before the tunnel, which leads to the LP301 (presently in a very poor state of repair, like most of the island’s roads). Walk 6 : The walk starts just west of Centro de Visitantes de El Paso (Caldera de Taburiente also prominently displayed on the building). Walk 7 : Descent from Birigoyo now starts with some tight, but easy zig-zags where there is insufficient grit or steepness to skitter. It’s not until you get down to the crater that you encounter a few inches of grit underfoot. Walk 10 : Walking the rim of San Antonio crater now 5 euros pp. You might be able to sneak past the ticket office if you ignore the sign forbidding pedestrian access to the car park from the Fuencaliente side, but you have to present tickets to the young lady at the entrance to the visitor centre : the only realistic gateway onto the path. There is now chain fencing along the rim and on the narrower bit, it’s on both sides of you. Walk 14 : The road up to El Pinar was surprisingly the best surface we drove on and the tarmac now extends further than the start point. Walk 20 : Where the narrow tarmac lane taken at wp2 bends to the right in less than a minute, a waymarked path heads off to the left, rejoining the lane just above wp3. According to the signpost at wp2, the distance to Don Pedro is 6.n km. Walk 30 : There are 2 signs to Pico de la Nieve on the track by the start of the walk, but they don’t indicate distance. Walk 32 : The track leading to the car park at start of walk is now only suitable for 4WD, imo. Most of the hire cars which attempt it ,don’t make it all the way. The alternative signposted, but not waymarked, route to/from the ridge is very worthwhile. It involves a little bit more ascent and is a bit longer, but there are several points where different aspects of the peak and caldera are seen. Shortly after the last signpost : ‘1400 metres to Pista de Valencia’, the track forks and it’s the left branch, which soon dwindles to a path that leads more directly to the tarmac. I’m going to write a review on amazon to emphasise the practical superiority of your guide over *********. I will certainly be buying your guides to the other Canaries, rather than wasting money on “updated” versions of **** ********* efforts, good though they were at the time they were written. If you’re in the UK or northern Europe you have most likely had enough of gales, floods and dark skies. 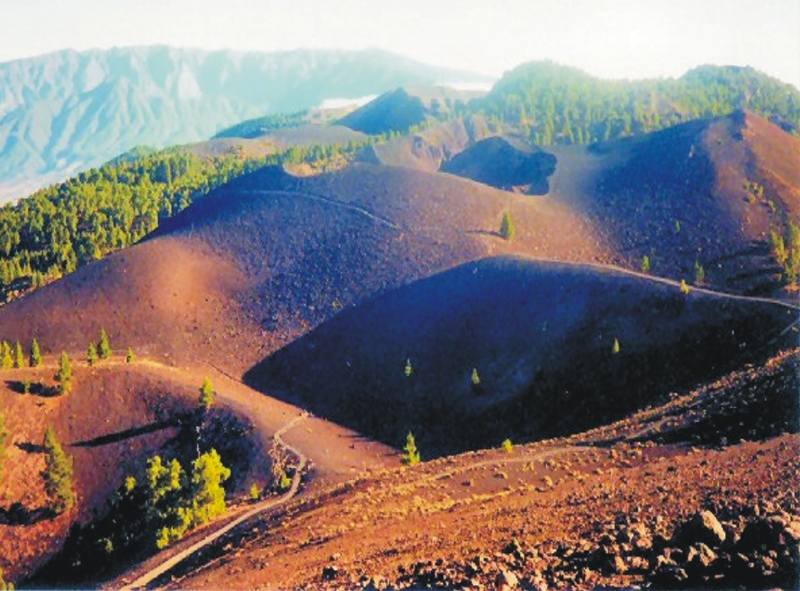 On the teardrop-shaped volcanic island of La Palma, Canary Islands, the forecast ahead is for almost wall-to-wall sunshine with daily highs of 20-22C and not much less than 16C in the night. Even better, it offers dramatic and wonderful walking. And you could be there within 5 hours’ flight time from UK and many European airports. 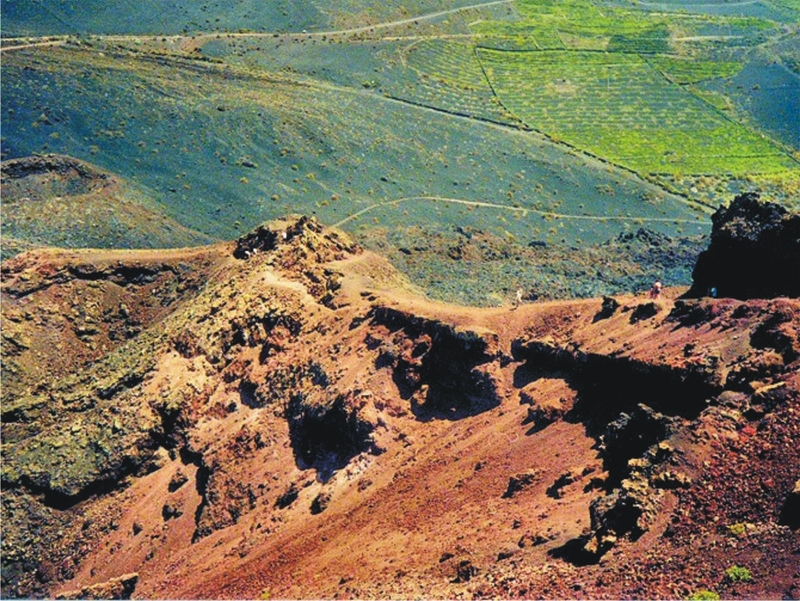 The image (right) was taken while following the Ruta de Los Volcanos. And how about following the route of the southern volcanoes (left)? Much of the walk is along the volcanic ridge that bisects the island west-east, offering super views. 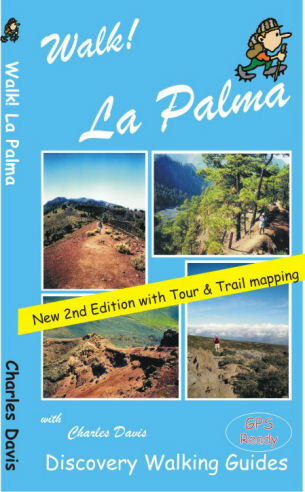 Here’s how it looks on the La Palma Tour & Trail Map. 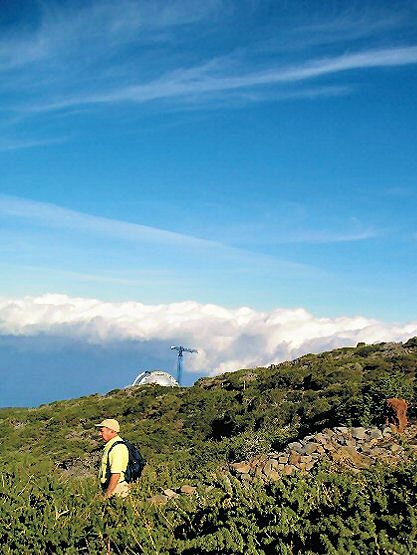 The image below shows a walker starting out on the Roque Palermo route; La Palma’s famous observatory can be glimpsed in the background.